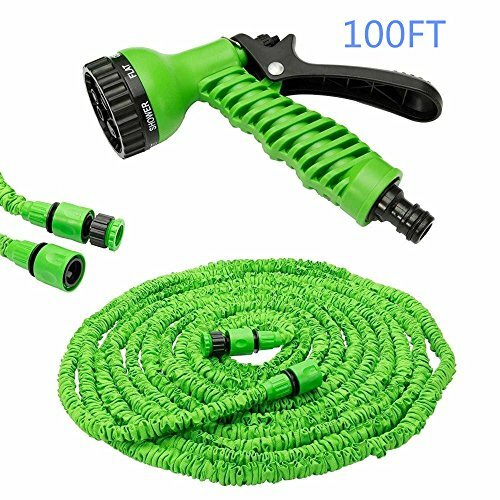 Weight:820g (100FT) Water pressure: 3.0 mpa Colors: Random Green/Blue Scope: Car wash cleaning things✔MULTIPURPOSE HOSE: Ideal for many watering and cleaning uses, such as gardening, car washing, house cleaning, etc. ✔MULTIPURPOSE HOSE: Ideal for many watering and cleaning uses, such as gardening, car washing, house cleaning, etc. ✔7 SPRAYING WATER MODE: Comes with an 7-in-1 multifunctional spray gun with 7 adjustable modes, including shower, flat, center, cone, full, mist, jet. ✔HIGH QUALITY: The pipe, connectors, valve, nozzle and spray are made with durable premium materials and fabric. They will not rust, leak, tear, rip or crack, and are designed to be long lasting. ✔DOUBLE LAYER LATEX: The shrinking hose using strongest material in the market, the tightly knitted outer fabric gives you visual enjoyment; Super strong quality to avoid hose pipe busting, 3 times expanding. ✔LIGHTWEIGHT AND PORTABLE: Garden water hose no more straining your back by carrying something very heavy. Never tangles and non kinks. Stay shrink when it' s not using, very convenient for carrying and storage. Don't hesitate to get it, Click The ADD TO CART Button Right Now! If you have any questions about this product by LINFON, contact us by completing and submitting the form below. If you are looking for a specif part number, please include it with your message.